A group of psychologists working at HP’s Social Computing Research Group has found that humans are more likely to change their minds when fewer, rather than more, people disagree with them. 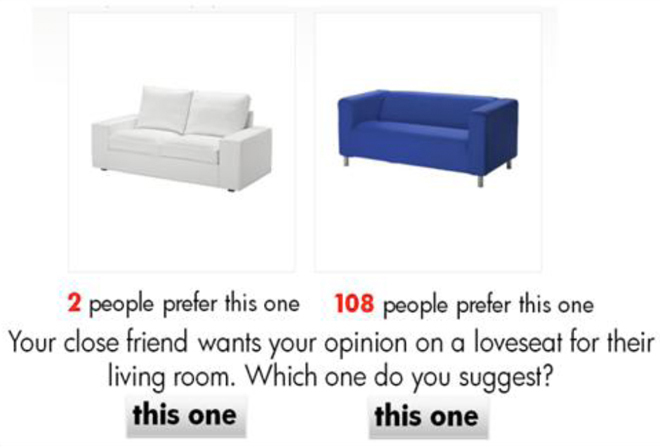 The team conducted an experiment asking several hundred people to choose between two pieces of furniture. After a varying amount of time, they were asked to choose again between the items, but told that a certain number of other people had preferred the opposite item. The results showed that a small amount of social pressure to reverse an opinion was far more effective in getting people to change their minds than if the pressure was much greater. When an overwhelming number of people were shown as having made a different choice, people tended to stick with their original selections. There are two conflicting theories of social influence at work here. Psychological reactance theory says that when we’re exposed to opposition to our beliefs, our self-preservation instincts kick in to make us stick to them. Social influence and conformity theory, however, suggests that being socially connected with others is important to humans, and we’ll reverse an opinion if we feel like it’ll let us “belong” to a group — the “peer pressure” effect. The psychologists believe that the first theory becomes more powerful when we’re confronted by the opinions of many others, but the latter kicks in when we’re in a smaller social group. That chimes with earlier work done by the same team that shows that votes on rankings are influenced by our desire to impact the choices of others. We like to have an influence. The next step for the team is to bring quality into the equation. Is it volume of recommendations, or the source of those recommendations, that carries more influence? If 1,000 strangers recommend something, but four close friends differ, who would you side with? The full research paper is available on HP’s website.